Pictured are President Kathy Hutchins and Marge White on September 15th, 2014 at the September 15th meeting of WCCP. 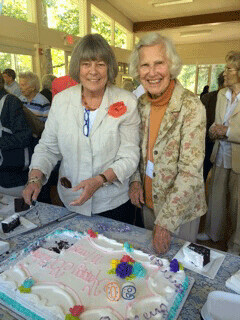 Marge celebrated her 90th birthday at a party after the Club heard Dr. Barbara Gitenstein, president of the College of New Jersey speak on “Contemporary Challenges for Quality Education in America”. This entry was posted on March 11, 2015 by The Women's College Club of Princeton, NJ in Uncategorized.